Discussion in 'Canon InkJet Printers' started by Grandad35, May 13, 2005. This is a long story - I'm warning you in advance. In defense, I think that I may have found something that explains some of the strange "terminal clogged head" reports and may have even found a way for the adventurous to attempt a fix on a terminal head that is out of warranty. I recently got a new head under warranty for my i9900 because the "heat sink" came loose and was making a noise when the head reversed direction. The new head performed perfectly until 3 days ago, at which time, the PM stopped printing anything. This head has never seen anything but commercial head cleaning solution, alcohol and my bulk ink, so there is no possibility of clogging due to incompatible inks. I checked the ink from the cart as well as the bulk ink for any traces of bacterial growth (long stringers) and found nothing. I tried most of the standard cleaning techniques (alcohol, cleaning solution, Windex/alcohol mix , overnight soak - but no compressed air) with no success. I didn't feel that I could legitimately request another warranty head, as I had been warned that 3rd party inks can clog the print head. I was ready to throw out my bulk ink and buy replacement ink from another supplier, as well as a replacement head, so I decided that it was either fix the head or destroy it in the process to locate the cause of the blockage. I then tried compressed air in both directions, and found that the channel wasn't just a little blocked - it was completely blocked. I would occasionally get some air to flow, but there were times when the channel wouldn't allow any flow in either direction. I used my hand vacuum pump to pull a vacuum on all 8 ink pickups, and only the PM channel was blocked. The only thing left to do was to disassemble the head, as shown in the 5 images combined below. The top image shows the back of the head after the two screws that hold the actual print head in place were removed. The connection between the electrical contacts and the head is flexible, but not flexible enough to remove the head, so I ground off the 4 plastic "nubs" that held the circuit board in place, using a Dremel hand grinder with a small ball-end tool. The complete head assembly was then easily removed. The third image shows an (out-of-focus) gasket that seals the 8 individual ink channels to the nozzles (2 of the holes are unused). The aluminum piece is actually "U" shaped, and it now appears to be used as a "heat shield" to block heat from the ceramic head from reaching the plastic housing more than a "heat sink". The 4th image shows the bottom of the plastic housing after the head was removed (the ink holes are about 0.7 mm diameter, so there isn't a lot of ink in the channels). It is not evident in this photo, but the plastic housing consists of two pieces that are apparently glued together at assembly to form the individual ink flow channels between the two pieces (I couldn't get them apart without breaking something) The 5th image shows the circuit board and head. I believe that the IC on the back of the circuit board is an EEPROM that is probably used to hold a serial number for each head, and it could also be used to hold information on the head's usage. Everything except the EEPROM was "potted" and could be covered with water without causing a short. Now that it was apart, it was quickly found that the blockage wasn't in the head at all, but in the plastic body! Since the head wasn't connected at this time, it was now OK to use a full 100 psi of compressed air for cleaning. After about 15 minutes working with compressed air and vacuum, the channel was re-opened (I have no idea where the blockage went). A little test rig was connected to each ink pickup with a 6" head of water, and water flowed through the right 6 channels at about 4 drops/second. The PM (the far left, "problem" channel) only flowed at 1 drop/2 seconds, and the 2nd channel only flowed at 1 drop/second, but this was still far more ink than would be required when printing, so it was decided to put it back together and see if it would print. Reassembly was easy. All liquids were blown out of the head before it was reassembled. A hot melt glue gun was used to replace the "nubs" that hold the circuit board in place. The cleaning cycle that is run when the print head is removed got the ink flowing to all 8 channels. The nozzle check was good, and the head alignment values were almost the same as they were when the head was initially installed. The printer is now back to normal - I'll let you know if it clogs again. What happened???? This analysis is pure conjecture, as it would be necessary to destroy the head to see what is inside - now that it is working, that will have to wait for a terminal illness. If someone has a scrap head, perhaps they would like to perform an autopsy and post the photos. It appears that the ink channels from the ink pickups to the print head are formed between two pieces of plastic that have the channels molded into them before they are glued together. I strongly suspect that some of the sealant/glue got into the ink channel during assembly and recently broke free and balled up to block the channel. 1. Would this have happened with Canon ink? Perhaps their ink doesn't loosen the sealant, but 3rd party inks do? 2. In a previous post, I asked if anyone had seen the situation where the head wouldn't allow back flow on a channel. I suspect that there was a similar problem on that head, but the blockage still allowed enough forward flow to the nozzle for it to print. If you have a similar problem on a terminal out-of-warranty head, you have nothing to lose, so give this "coronary bypass" cleaning method a try. Please post your results. I have seen a number of posts where similar problems were reported, and it is usually blamed on the ink. Perhaps the ink isn't the culprit. Perhaps Canon has an assembly/quality problem. thanhhuy123, PeterBJ and Nifty like this. I have experienced complete clogs with MIS and especially Colorbat inks. I also found that the Worm-Water sold by ColorBat clogged my printheads. I was able to unclog the heads easily by using the following method. I first rinse the printhead of all exterior ink and remove the rubber seals from the head. I then heat some distilled water, take a syringe with a small hose that attaches to the syringe an the printhead ink receiver, the hose most fit snug over the ink receiver, I then force the hot water through the printhead hole and that unclogs it. Do not over-force the water through the head or you could blow the head apart. I then refill the syringe with Windex and repeat the procedure. After I let the printhead seat in hot water, with some Windex leftover in the channels, for about a half hour, and that clean the printhead completely. Hey Grandad, if someone has a terminal head but isn't interested in taking it apart, would you be interested in them sending it to you to play with? Great work, Granddad! The mysterious print head is unmasked. If we subscribed to the conspiracy theory, we would conlude that Canon manufactures an adhesive/OEM ink relationship that keeps the adhesive intact unless one uses a non-OEM ink in which case the adhesive breaks away and kills the head. A "sleeper" killer in our midst. The stuff of Robert Ludlum or LeCarre novels. Epson foolishly does it in a more direct fashion with chipped cartridges that can be thwarted. Robert - This was a case where the usual fixes just didn't work - I tried 3 different cleaning solutions, both hot and cold; things that have always worked in the past. I use a syringe and a soda straw to push the liquids into the ink pickups - a little different than your technique, but with the same effect. I just couldn't get anything through the nozzles on the PM. Nifty-stuff - Sure, if someone wants to donate a cadaver for some experimentation, it would be an interesting test. The first test would be to remove the nozzles and find whether the blockage is in the nozzles or in the body. If it's in the body, it would be worth a try to open the channel before destroying it. The goal of this is to find a way to bring these heads back to life - an autopsy would be performed only if there is no hope. If someone has a candidate, send an e-mail to Nifty-stuff and he'll e-mail you my shipping address. Fotofreek - I am not real big on conspiracy theories, but I have seen lots of cases where such things happen inadvertently. 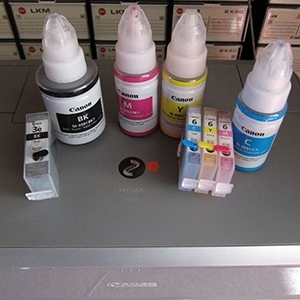 Suppose that Canon decided to eliminate alcohols from their inks to reduce the rate at which a low usage cart "dries out" in the printer and thereby increase the useful life of their carts. If they tested this ink in their printers they wouldn't see any problems. They obviously would not say anything about their new formulation to the outside world. Alcohol is often used as a cleaning agent because of its ability to loosen the bond between many materials, including adhesives. If I remember correctly, one of the HP patents specifically stated that they use alcohol as part of their formulation - maybe to keep the heaters in the nozzles clean. It wouldn't be surprising if other ink manufactures do likewise. If an alcohol (or some other component) in 3rd party inks causes the excess sealant to break free, Canon might not even be aware of the specific problem - they would just say that "3rd party ink caused the clog" and forget about it. Of course, I was kidding about the vast ink cart consipiracy! This might just be a situation where certain of the print heads are destined to fail at some point and If you are using third party inks at the time they get the blame. Causal relationship assumed where none existed. I have always been concerned about the use of alcohol for cleaning the printhead. I read somewhere that what causes the ink to be ejected from the head is an electric charge, which causes a mini- explosion in the printhead. My concern is that it may cause a fire. Here is a link to the MSDS sheets for 70% isopropyl alcohol (common rubbing alcohol). This information indicates that rubbing alcohol will burn. However, to put this into perspective, here is a link that says that to "flamb" your food, you want to use a brandy or 80-proof liquor or liqueur, as liquors that are higher than 80 proof (40% alcohol) are too volatile when lit. (http://whatscookingamerica.net/flambe.htm). For those who like their 100 proof scotch "neat", this would indicate that you should never drink anywhere near a smoker, lest your drink catch fire. Obviously, the risk of high proof alcohol bursting into flame is very small, or there wouldn't be any scotch or vodka drinkers. The following link describes how a thermal "drop on demand" inkjet printer works - there is no "explosion" in the print head - just rapid boiling. Even if there was an mini-explosion in the ink, there is no oxygen to allow the alcohol to burn. Finally, even if you used pure alcohol to clean a head, the printer would run a long cleaning cycle when the head is reinstalled and this would vacuum out the alcohol before the printer ever attempting to print. "I have a 2 year old Canon printer that worked great until recently. I was using Canon OEM ink, but the black went on strike and refused to print. To print text, the 3 primary colors had to work overtime, and used loads of "costly" ink. I tried all sorts of ways to clean the print head but to no avail. I was just about pulling my hair out with this printer. I contacted Canon directly and this is what the lady said to me: "You can send the print head in to us but we will have to charge you a maintenance fee of 25 pounds; if we find you need a new print head we will waver this fee and only charge you for a new one which will cost you 56 pounds". Hearing this I asked if there was any way possible I could clean the print head and she replied, "I'm afraid not, no one has told us how to do it" and she began to laugh in a surprised type of way. I then thanked her for the help and replaced the handset. I read through many of the posts on this forum dealing with clogged print heads. In particular, I decided that the post http://www.nifty-stuff.com/forum/viewtopic.php?id=241 was something that I would try since I had to buy a new print head anyway. It took me about 5 mins to dismantle & 1 hour to clean all the jets. I used hot water & dish detergent, then dripped vodka through the ports. I used paper towels to quickly dry the parts, put it back together and it works fantastic. I would caution that you need some mechanical skill to reassemble the print head because the alignment of the parts is critical. I didn't use a glue gun but merely popped the circuit board back on to the 4 prongs, and I must say it works as good as new. I now fill my cartridges with third party ink's using syringes and this works fine and is amazingly ccccchhhheap.